Yesterday, Samsung announced a new line of SSD’s called The Samsung 840 EVO series; The Samsung 840 EVO is a consumer high performance SSD which for the first time comes in a 1000GB option along with four other options (120GB, 250 GB, 500GB, and 750GB). The pricing seems to be middle of the road until you get to the 1000GB model which seems to be quite the cost saving bargain when looking at Price Per GB at just $0.65 which is considerably low when compared to other premium SSD brands. When compared to Samsung’s other consumer lines it seems to be the middle child so to speak with the 250GB Samsung 840 being priced at $175, The Samsung 840 EVO 250GB at $189.99, and the Samsung 840 Pro 256GB at about $229.99. 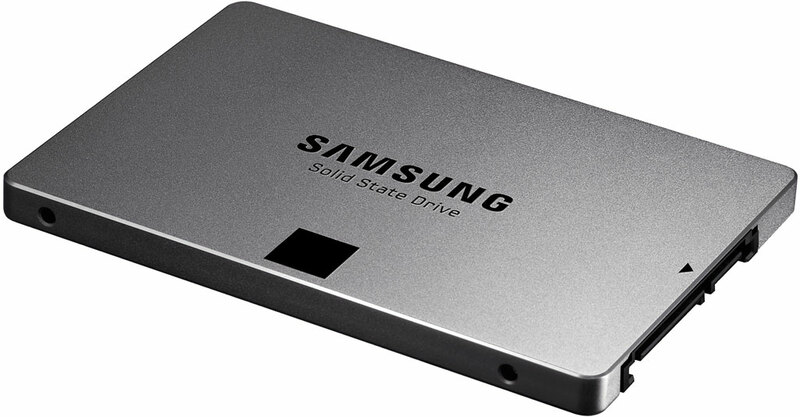 This new range of Samsung SSD’s seem to be in the high end of performance once you get into the 500GB and above range, however, before that you do see lower performance. Whereas many technology reviewers will focus on the read and write performance it is also very important to consider the Random Read and Random Write performance because those numbers will more accurately represent the performance of everyday things such as opening large applications. Even though most will never use an SSD to its full potential it is still important to consider these facts. However, once you get to the 500GB level you do see a noticeable increase in random write speeds. Essentially, what Samsung is pushing this new EVO model because of their newer controller the Samsung MEX which has a new capability for their smaller capacity models called TurboWrite. This is great to see because in the past the write speeds on smaller capacity SSD’s has been much lower than their older brothers. For comparison, the Samsung 840 120GB is rated at 120 MB/s and the New Samsung 840 EVO 120GB is rated at 410 MB/s. The bottom line is that this new Samsung SSD looks to be a promising middle priced high performance SSD for the consumer. However, because Samsung is using a new controller with this device we do recommend that you should wait to buy until there have been some solid reviews! Sidenote: At their SSD Summit event Samsung also announced the XS1715, an super-fast NVMe (Non-Volitile Memory Express) SSD with storage options of all the way up to 1.6 TB! The XS1715 is the first and only 2.5” sized SFF-8639 SSD using PCIe 3.0 to encourage a max sequential speed of 3 GB/s, as well as 740k IOPS. This past month was a busy one for everyone at TCH, most notably our techs and CEO. Part of our continued goal is to provide you with the fastest, most reliable service possible, while staying current with the latest technology. Over the course of the past month, Bill, TCH’s CEO, spent countless days and nights at the Data Center replacing Distribution Switches, upgrading routers, building new servers and more. Below is a summary of what’s been going on lately here at TCH! We Hired a New Tech! We are happy to announce that we have hired a new, full time support tech! After many interviews and much consideration, we welcome Deepak to the team! He comes to the team with experience and knowledge and is excited to work with you, our clients. See full thread here. We first sent out an e-mail to certain clients regarding mass hardware upgrades that were coming soon. Aside from adding another layer of redundancy to our network, we also have been swapping out Distribution Switches with new Cisco Switches and installed an additional fiber drop from our upstream provider. We also migrated four shared servers to new servers with new hardware. During upgrades we try to maintain as much communication between the TCH team and our clients. Over the past several weeks you may have seen various blog posts like The upgrades are coming, Network Maintenance!, Round One Complete and Round 2 is done! Shortly after we performed more maintenance and posted Scheduled maintenance Starting Now and Scheduled Maintenance Complete. In an effort to continue to push as much information and news to everyone we have developed a free Android app dedicated to our blog. Get notified and read our latest blog posts right from your Android device! You may download the app in the Google Play store or scan the QR code below from your Android device. Google Nexus 7 Tablet Winner! We are very pleased to announce that the re-birth of TCH’s Family contest was a complete success! Congratulations to Irene from NJ for winning herself a brand new Google Nexus 7 tablet! Our Facebook Page received and overwhelming amount of likes and we are excited to keep giving things away on it! Irene will be posting a picture of her new tablet on the page soon, so make sure to check it daily. Who Wants More Free Stuff? This month we want to switch up the contest a bit. Simply ‘Follow’ our blog via the ‘Follow’ tab on the bottom right hand side of this page. All you have to do is follow our blog by entering your e-mail address and you will be entered into this month’s family contest! The winner of this months contest will receive a brand new Kindle Fire HD Tablet and a TCH T-Shirt! A winner will be picked at the end of April. You can see complete details here. On March 7, 2013 at approximately 3:20PM our network monitoring system detected a large amount of inbound traffic to several segments of our public facing network. This prompted our alerting system and we started to investigate. The attack was large but nothing our tech team couldn’t handle! You can see all details here. TotalChoice Hosting has been granted by ARIN (American Registry for Internet Numbers) additional IPv4 Allocation. In other words we will be adding a pool of IP addresses which will be available to our clients! You can see our complete blog post about it here. Remdiner: Change Your Passwords & Update Your Scripts! We would like to remind you how important it is to change your passwords regularly and to always keep all of your scripts / software up to date on your web site. Read the entire article here. Has It Been A Decade Already? We posted a couple of how to’s that may interest you. Check out our recent article on how to add your TCH hosted e-mail to an Android device and also our article on popular Mac OSX FTP clients. It’s been a great month here at TCH and we are excited about things to come. Thanks again for choosing TotalChoice Hosting! What makes a good Web Hosting Company? Spam and Virus Protection now available for Shared Hosting Clients! Copyright © 2019 Total Choice Hosting, L.L.C.